Whether you are a disabled driver or you are looking for a vehicle for a family member, or carer, to drive on your behalf, Jeep Belfast has a fantastic range of Motability cars on offer. As a long standing Motability member we understand how important it is to choose the right car for your mobility needs, and at Jeep, we believe having a disability should not mean compromising on style. That's why we offer an award-winning range of versatile, roomy and stylish vehicles for you to choose from. Charles Hurst Jeep in Belfast, Northern Ireland are pleased to offer our customers Motability deals on our impressive Jeep Renegade from NIL Advance Payment. Our Motability Specialists are on hand to make Motability applications easy and hassle free for our customers. 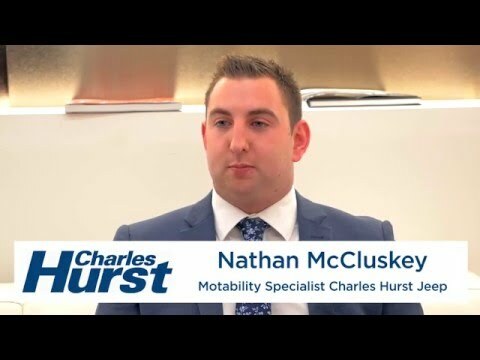 Charles Hurst have recently won Regional Dealer of the year for customer satisfaction in Motability. If you receive either the Higher Rate Motability Component of the Disability Living Allowance (DLA) or the War Pensioners' Motability Supplement (WPMS) then you could qualify for a brand new Motability car. Contact us today on 0844 659 7690.